Cross-posted to the IMS Milan Society. A number of prospective incoming students have contacted us, asking about how they can find housing in Milan. For me, finding housing was very easy. I am first going to tell you what I did, and then look at some of the other ways of going about it. This post is about Milan, but many of the principles herein may apply to Bari, Naples, and Rome — big cities — and perhaps also Pavia. Before arriving in Milan, I looked at the map of the city, and tried to find a neighborhood within 20 minutes or so biking distance to the various locations that IMS students frequent in the first two, pre-clinical, years. I settled on Lambrate, which is a sort of mixed residential/retail shopping/industrial area with a lot of art studios, on the eastern edge of Milan. I then booked an AirBNB there for a week. It was a whole, fully-furnished, apartment — with a separate living room, bedroom, kitchen, and bathroom — for about 40 euros a day. Of course, that is more than I would be willing to spend in the long-term, but it was a good short-term solution. I have, in the past, posted a map showing my apartment and its location relative to main IMS sites, and now I repost it here. The little doggie (why not?) 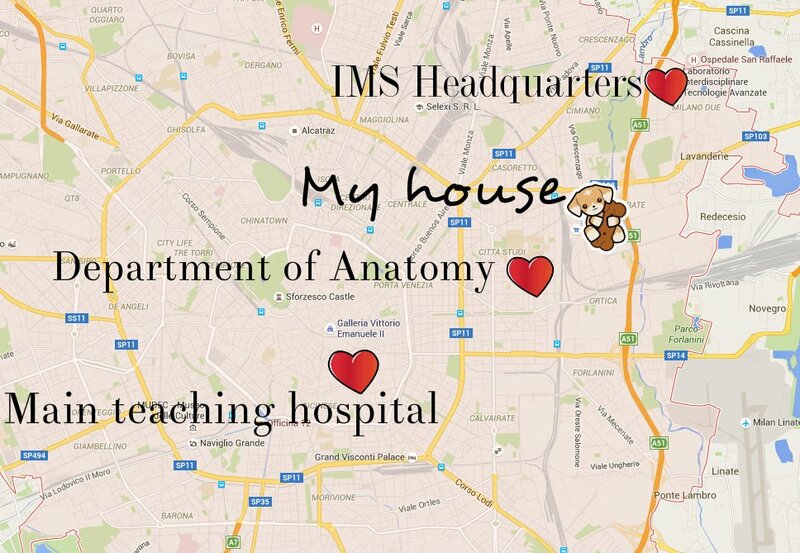 represents the apartment, and the hearts, IMS facilities. 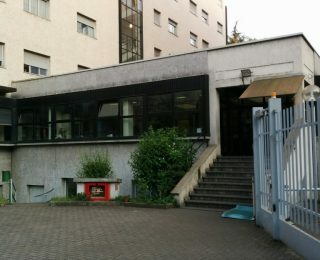 The main teaching hospital is across the street from the central campus of the University of Milan. My landlady lived in the United States and speaks perfect English. I told her that I was looking for a place for six years — the duration of our programme at IMS — and she offered me a long-term contract for the apartment. It was the standard contract in Italy: four years long, with a three-month out clause. This means that she cannot raise my rent for four years, but I must give her three months notice before leaving, or else I lose the deposit (which is one month’s rent). She reduced the price to what is typical for the neighborhood — 850 euros per month for a one-bedroom apartment — and I signed the contract. IMS had not started yet at this point, and I had some business in Rome for a few days, so I left Milan. When I came back ready to move in, my landlady had done an amazing job cleaning and preparing the place. I wanted for nothing — kitchen and bathroom supplies, WiFi, hardware — it was all there, and she even left a chocolate on my pillow for me. I have been living very happily in this apartment since. One of the great advantages of having a 2nd room is that it allows me to have guests, and for the last nine months I have received friends from back home, as well as current and prospective IMS students who needed a place temporarily. I also immediately bought a bike at a bike shop, which allowed me to get all around the city for free. Start in a hostel or hotel. Book it before you get here, which should be before Oct 22 at 1 PM for New Student Orientation. There are some quite inexpensive youth hostels in the city, which are clean and charge on the order of 20-40 euros a night. 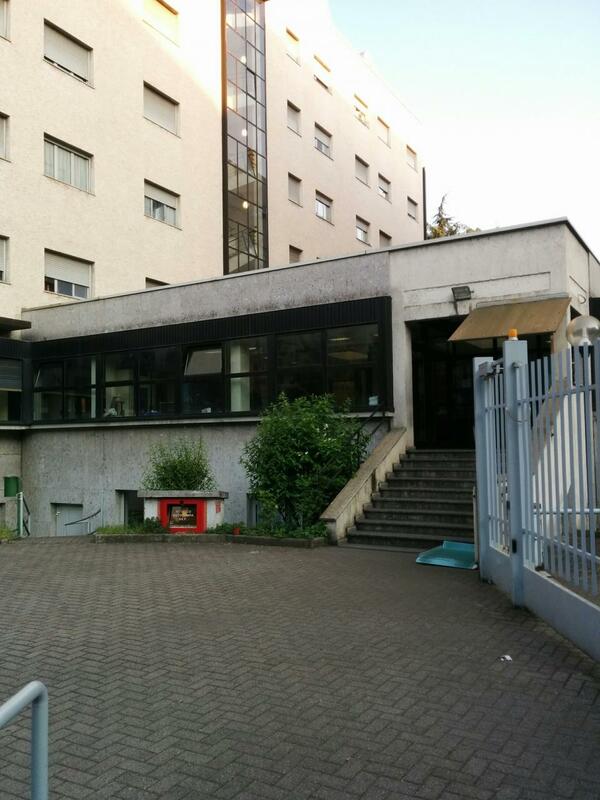 One of them, the Milan International Hostel, is in walking distance of LITA, where you will have your first classes. Another, the Hostel Piero Rotta, is on the other side of the city, but offers very basic accommodations advertised at 18 euros/night. Alternately, the IMS has a deal with a hotel which is right across the street from LITA, the NH Milano Due, to provide studio apartments on a monthly basis. I believe the cost is 800 euros per month, which is almost twice the price of a studio in Lambrate or other IMS student neighborhoods like Cimiano or Casoretto. However, it is a hotel, so you have a regular cleaning staff and beautiful facilities (including a kitchen), and could possibly share it with a roommate, bringing your costs down to 400 euros/month. I know of at least three IMS students who have chosen simply to stay in the NH Milano Due long-term. So you always have the hotel as a backup option; think of it as a kind of really fancy dormitory right next to the school. Alternately, see if a current or incoming IMS student can put you up temporarily. If you cannot do a hostel or hotel, another option is to reside, when you get here, in the guest room or on the couch of a current student, or incoming student who has already found housing. If you expect to have a place at IMS Milan this year, you should absolutely join your class’ Facebook page. You can also join the IMS LITA 2014 group, which has grown to include students from a number of different years. On these groups, you can post that you are looking for housing and ask if anyone can help. This is also a great way to find another student who is also looking for housing, and the two of you can team up as flatmates. Walk around the city and look for signs that say affitti (“rentals”) or affito (“rental”). Italy is very convenient in that when a building has an open unit for rent, very often there will be a sign on its exterior advertising the rental, with a phone number. That is frequently the number of the landlord, not a rental agency, so you can avoid the fees of a real-estate office. The person who answers the phone may or may not speak English, so if you do not speak Italian, it is better to get an Italian friend — for example, an IMS classmate — to make the call. Usually, you will agree on a time to look at the apartment, and frequently you are offered a contract on the spot. One of the nice things about Milan, compared to London or New York, is that although it is an alpha world city, the real estate market is not nearly as competitive. (Reasons for this are that many more young people in Italy live at home, and Italians, in general, are more likely to own their own home than in London or New York.) So, you usually do not end up competing with a bunch of people for the same rental. A deposit should be one or two months’ rent. You can do all this with a fellow student, and rent an apartment together. It is normal in Italy for two people to share a one-bedroom, with one person sleeping in the living room, and also for two people to share and sleep in the same room. If you get an apartment like mine, you could theoretically fit four people into it (two in each big room), and bring your costs down to 212 euros per month per person. So there you go. 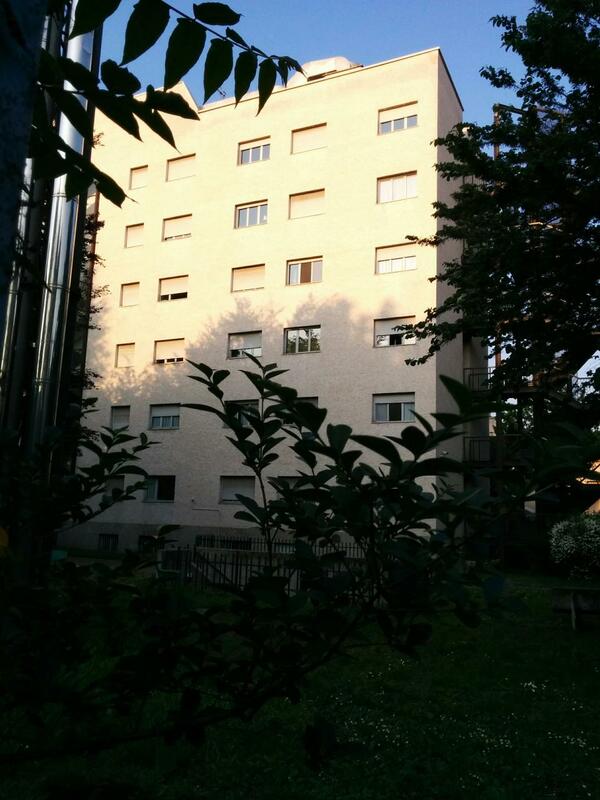 These are some beginning tips about finding housing in Milan. The most important thing is to get into a stable situation from the day you get here; you do not want to be schlepping all your stuff from one place to the next during your first days in Milan, which will be full enough already with things to do. So it is probably smart to book a hostel, hotel, airBNB, couch or guest room first. Then, you can spend a bit of time to find a more permanent place. I also highly recommend that you get a bike, with a lock and helmet, if you are able to cycle; it saves you a lot of time and money that would go to public transit. (A car would also be a convenient option, if you have a place to park it at home. There’s parking at LITA.) And please be here ready for New Student Orientation at 1 PM on Saturday, Oct 22.